It's clear. These frames are hot. Made of a transparent material and available in a variety of patterns and styles, they'll add hip-ness and chic-ness to your projects. Position them over photos to highlight something special or front and center on a card to call attention to your greeting. Because they're uniquely sheer, anything you place them over will be visible through the frame. 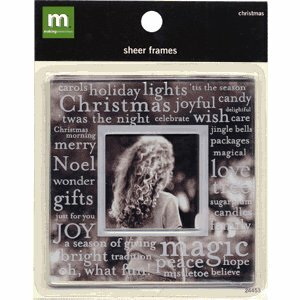 Features: Archival safe Self-adhesive Made from clear acrylic with words and designs printed on frame One frame per package Frame size: 3 1/4" x 3 1/4" Frame opening 1 1/2" x 1 1/2"